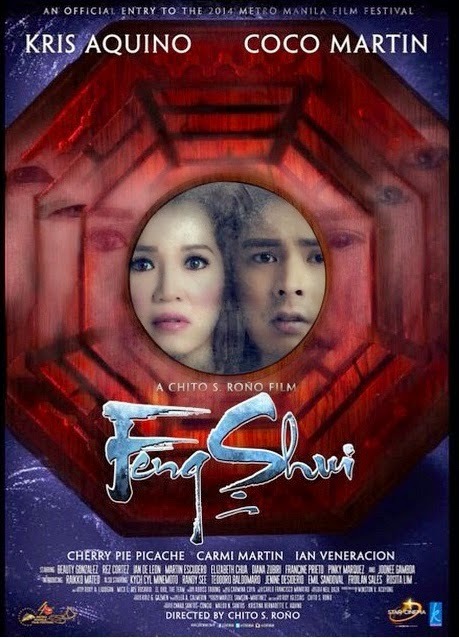 Star Cinema and Kris Aquino Productions just released the most anticipated official full movie trailer of their Metro Manila Film Festival 2014 (MMFF 2014) movie entry entitled, "Feng Shui 2" on ABS-CBN's Aquino and Abunda Tonight. The much-awaited full movie trailer of "Feng Shui 2" is happening later, tonight, and we have it here below. "Feng Shui 2" stars Kris Aquino and Coco Martin, where Coco Martin's character, Lester steals the cursed Bagwa in a Chinese temple and will experienced what Kris Aquino's character, Joy experienced a few years ago. It was 10 years ago since the first "Feng Shui" movie was shown, and its timeline will follow in the sequel. So, based on the story of Feng Shui 1, Coco Martin will also get rich while his relatives and loved ones who sees or looked into the cursed bagwa will die according to their animal birth signs. For example, a friend of Coco Martin's character was born in the year of an ox, he/she could have been killed with a cow/bull/carabao's horns, among other things. In the Aquino and Abunda Tonight, Kris Aquino revealed that there will be two killings by the bagwa and that Lester and Joy's path crossings make the killings stronger. A back story on Lotus Feet will also be revealed. In the trailer, it was also revealed that there are two Lotus Feets. It's good to know that Star Cinema and Director Chito S. Rono finally decided to make a sequel to the 2004 megahit movie, because fans of this horror film really misses the famous Lotus Feet. Anyway, below is the full movie trailer of "Feng Shui 2"!